I tried my hand again at farming. This time purely by default. When my farmers left the garden they left it chock full of goodies. Beautiful winter veggies that were going to go to seed if I didn’t do something quickly. So one afternoon I trekked out back with a Lululemon bag in hand and a romantic vision of putting together my own “CSA Basket” from the farmers hard work. The sun was shining, it was a mild 70 degrees in December and there I went to “reconnect” with Mother Earth. I quickly realized I was ill-prepared. Thankfully, the grounds gardener stopped by and offered me items 1-3. Within an hour I had filled up several large trash bags full of kale, beets, lettuces and carrots. I day-dreamed about the lovely recipes I’d be cooking that week and how I’d wow my dinner guests with stories of “picking my own veggies straight from the garden”. It was so idyllic, nothing could go wrong. After an hour, I stopped for a break and to soak in my own foodie daydreams. But, as I sat, something felt wrong. Something was missing. Oh no, it couldn’t be…where was my wedding ring? I quickly scanned the ground, ran up and down the row and started digging by the weeded butternut squash. No sign of the ring. As I looked over the acre of garden I just walked through, a complete hysteria came over me. That ring could be anywhere. It was a needle in a haystack. I seriously may never find it. And, that’s when I lost it. Screaming, hysterical profanities spewed from my mouth. Sure, I knew the ring was too big and I knew it needed to be sized. I’d even been wearing a fake ring for months because I’d been worried it’d fall off and I’d lose it. So why, today of all days, had I put it on? Well, it was simple, I’d worn the ring to remind me to take it to the jeweler and get it sized. But, as Murphy’s Law would dictate, at the last minute I had decided to go for this tromp in the garden. So, there I was with 7 giant bags of kale and plenty of carrots, just not one of them sparkling. Could I get a metal detector before it got dark? If not, should I sleep in the dirt to ward off trespassers and blingy-diamond-obsessed raccoons until I had recovered the ring? My screaming hysterics caught the attention of the grounds gardener, who by now had clearly guessed I belonged back in the office rather than the garden. As I ran around in circles pointing at my ring finger, crying, she somehow gathered what I was saying through my jibber-jabber. She calmly asked me if I’d checked the glove. No. Why would I? That would have meant I had brought item 4. Sure enough, there was my wedding ring. I tossed my 7 giant bags of kale and lettuce, beets and the edible carrots into the back of the golf cart and gave the gardener back her supplies. On the way to the jeweler I contacted San Diego Roots Sustainable, who gleans unused veggies and fruits and donates them to the food banks. 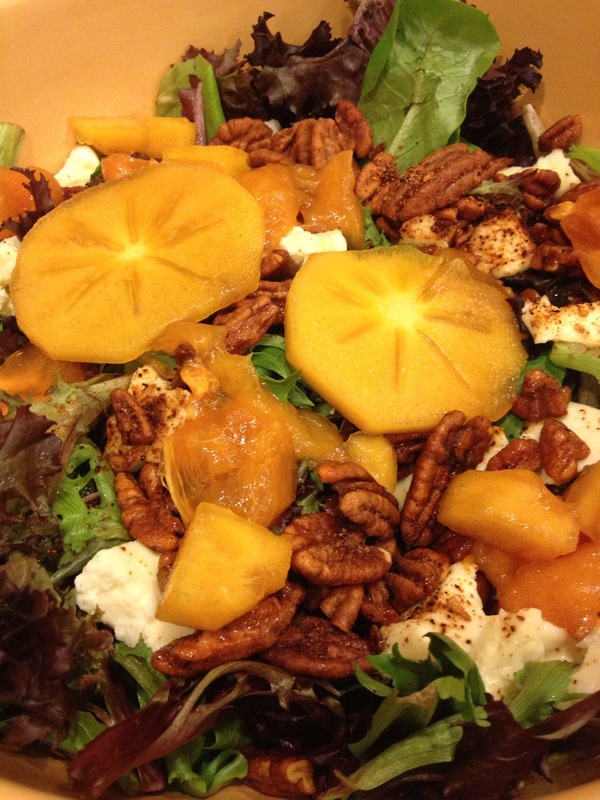 I made this salad for dinner and confessed the story to Hubs. No, I have not tended the garden since. But, I have found some new cool gardeners who want to take it over. And you know what I realized? The first day I met them, they brought items 1-4. Oh, and distinctly no jewelery on any fingers. So naturally, I have instant respect for their savvy already. If you can’t find persimmons in your area feel free to omit or add your own local fruit delicacy. * If you don’t have Pumpkin Balsamic Vinegar add 1/2 tsp of Pumpkin Pie Spice to regular Balsamic Vinegar. Combine dressing ingredients and set aside. Crumble goat cheese and add to washed greens. Peel and slice persimmons length-wise for prettiest presentation. Top with pecans and toss with dressing. This recipe is a prime example of how hectic things have been in the Foodie kitchen. I started this post back in early November of 2012. That’s right, 2012. Since then, I’ve made it a handful of times including this Thanksgiving to rave family reviews, and many a request for the recipe. “Don’t worry, I’ll blog about it”, was my answer. Well maybe they should worry, because the people I told that to last year have sure been waiting a long time. What’s going on with the unceremoniously unsexy soup photo on the right? Apparently, I never took a photo of the final product. So I decided to still use this photo in the post, otherwise you’d be waiting yet another year for the recipe. So to fill you in on what has been keeping me busy these days, I’ve put together a Q&A with myself. The hardest part about making this soup is cutting the squash into cubes. If you don’t have a very sharp knife buy the pre-cut squash in the store. Equipment– Stockpot or dutch oven, 8-in square baking pan, and immersion blender* (see note below), blender or food processor, large very sharp knife. For the croutons– Follow package directions, for easier cutting use an 8-in square pan and make 2-3 days ahead. If short on time you can make it the day of but make sure you give it plenty of time to cool. Increase toasting time by 10 minutes. The day of serving I cut the cornbread into 1-in squares. Heat the oven to 300 degrees. Spray a rimmed baking sheet with oil or Pam. Place the cut cornbread on the pan and toast until dark golden and crisp, about 30 minutes. 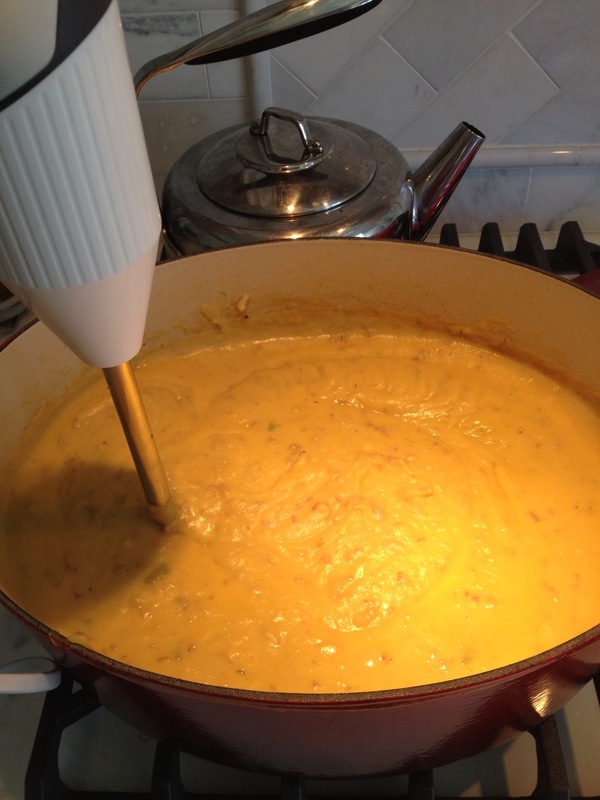 For the soup– To cut the whole squash into cubes, peel the squash and cut in half lengthwise. Then remove the seeds. Chop into 1-inch cubes. You can do these several days in advance and store in ziploc bags. To slice and clean the leeks, chop off the end and the hard dark green parts. Thinly slice and put in a bowl of cold water to get out any remaining sand and dirt. If storing to use at a later date let air dry. In a large stockpot or dutch oven, saute the cubed butternut squash and leeks with a tablespoon of olive oil over medium heat. Salt and pepper to taste. Cook over medium heat until squash is soft and can be easily pierced with a knife. Then add 4 qts stock and adjust to medium high heat and bring to a boil. Once the soup boils, return to simmer and either 1. insert immersion blender and blend until smooth and creamy or 2. wait for the soup to slightly cool, try to figure out the best and least messy way to transfer all that soup in batches to the food processor or regular blender and pray you don’t scald yourself in the process or 3. turn the stove off and go buy an immersion blender. You’ll thank me. Once the soup is blended, add the entire jar of Classico Light Alfredo. It may sound like cheating but it adds a brilliant amount of creamy flavor in 5 seconds flat. I suspect it’s the reason this soup gets so many recipe requests. Stir in 1/4 tsp. cinnamon and 1/4 tsp. nutmeg and simmer until service. *I use a Bamix immersion blender. I have also used Viking and it works quite well. If you ever intend to make blended soups with any regularity this is a great tool to have. You only need your regular blender to explode hot soup all over your kitchen once to be seriously injured and or permanently ticked off. In case I still haven’t sold you on this tool, I also use it to quickly thicken up stews, coq au vin etc. Also, Hubs uses it daily for his morning workout shakes ever since I threw out his magic bullet. But, that’s a touchy subject, so please don’t mention it. On our recent trip to the Bahamas, I was taken aback at the cost of food. Milk was nearly $8 a gallon, a dozen eggs was $7 and as you can imagine the cost to eat out, even more. Since I am innately frugal and have two small somewhat picky eaters, I decided to schlep a large duffel bag full of non-perishables on our vacation. Our vacation villa had a small kitchen and I planned to make breakfasts in the room, pack heavy snacks for lunch and grab take-out for dinner. Hubs and I flew separately this trip. Not because we are super paranoid about plane crashes but because he had to stay back and work. Since one of our children was so naughty on his last plane trip with Mommy , he was permanently placed on my “no-fly list”. Therefore, Hubs had the pleasure of escorting him solo. Of course, they had no issues. Of course, it was my luggage that got lost. But, thankfully not the duffel bag full of food. I offered to watch our travel companions’ kids in our room while I awaited Hubs and “no-fly” one evening. I didn’t have a lot to cook that wasn’t totally kid-oriented. I did, however, order okra from the grocery store delivery because it was literally the cheapest green thing they offered. At $2 a pound I was compelled to buy it even though I’ve never cooked okra. But thankfully these days with the internet, you can find a recipe anywhere. But, on that day, the wi-fi was down. So, I searched through my duffel bag of random food-stuffs and the following items surfaced. Cheez-Its- hmm, it’s got potential, if I’m desperate. Oatmeal… no. Maple syrup…probably not. So many boxes of Mac n Cheese…what was I thinking? Pretzels, goldfish, graham crackers… no, no and no. Pistachios… oh that’d be crunchy but how can I get them ground up? Never mind, I’ll just snack and continue to look… Pop Tarts, heavens no… 1 Small box Cornflakes… YES! and I toss back the cheeze-its. 1 envelope Hidden Valley Ranch Dressing Mix (hello flavor! ), 1 small bottle Olive oil (not ideal for frying but I’m using a nonstick pan so let’s hope for the best) and big score! a bottle of Shake and Pour Bisquick. OK. This I can work with. So, I quickly went to work cutting off the end of the okra and scooping out the slimy innards and seeds. 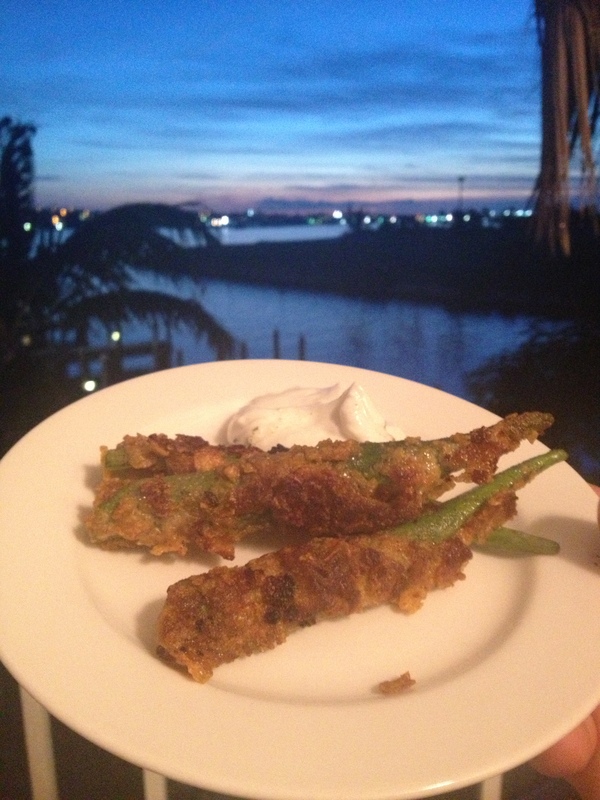 I figured frying okra would be like frying anything else. I made a 3 bowl set up. In the first bowl, I poured out enough bisquick mix to do a quick dusting on the okra. In the second bowl, I beat up 2 large eggs. In the third bowl, I crushed up the cornflakes. I dredged and dipped and rolled my way through the pound of okra keeping the cooked pieces in the microwave on the warm setting. Meanwhile, I mixed my hidden valley ranch dip mix into some plain greek yogurt for a dipping sauce. I snacked on pistachios, really sad I didn’t have a cuisniart to blend those little things up, and I drank a rum cocktail. The three kids sat happily watching a movie sun-drenched and exhausted from another exciting day. Mix yogurt and ranch dip and set aside in fridge. Cut ends off okra and scoop out slimy innards. Create bowl system, the first for dredging okra in bisquick, the second for dipping in beaten eggs and the third for rolling in the crushed cornflakes. Heat a non-stick pan over medium to medium-high heat. Add enough oil to cover the bottom. When it is heated place 5-6 okra in the hot oil turning to brown. Drain and keep warm until serving. Serve with ranch yogurt dip. Well, Boot camp is officially over and I didn’t come in first place. Sigh. For weeks now, I’ve been mad-dogging my competition “Robin” by keeping my weight loss totals hush-hush and slowly hacking 2 minutes off my incredibly slow mile. She knew I was after her and she really wanted first prize as well. There may or may not have been a picture of me in her fridge every time she opened it for a snack. It was a friendly competition and we kept each other motivated till the end. The 8 weeks went by surprisingly fast. So fast, that I decided I probably needed to extend to 16 weeks. Turns out, this boot camp really works. The food portion of the program wasn’t nearly as traumatic as I’d feared. Really, it just emphasized eating whole, natural foods, which I was already doing. Bonus, was I got to eat 5 small meals a day, which I quickly realized meant I was eating more than I had been and still losing weight. Brilliant. One of my early boot camp friendly favorite meals for Hubs and I was this tasty Chicken Lettuce Wrap. It’s a take on the gigantic appetizer at Cheesecake Factory. I suspect mine is lower in calories. With so few ingredients it’s important to make sure you have good quality lettuce. I use the fresh butter lettuce from my CSA that literally melts in your mouth. The weeks that I don’t get butter lettuce I substitute with Romaine as seen above. I make two side dipping sauces which are pantry staples. Marinate chicken tenders in cup Island Soyaki for at least 3 hours. In a separate dish, marinate sliced cucumbers in soy sauce, rice vinegar and sesame seeds. For the spicy peanut sauce– whisk together 3 Tbl. peanut butter, 1 Tbl. Soy Sauce and 1 tsp siracha. For the spicy soy sauce– whisk together equal parts soy sauce and rice vinegar and add 1/2 tsp of Siracha for every 1/4 c. of sauce. Whisk in sesame seeds and diced cilantro to taste. You can make both sauces ahead and refrigerate, just bring to room temperature before serving. I grill my chicken tenders on an All-Clad grill pan until cooked through. This is mainly because I’m still somewhat scared of our bbq. You can use either. 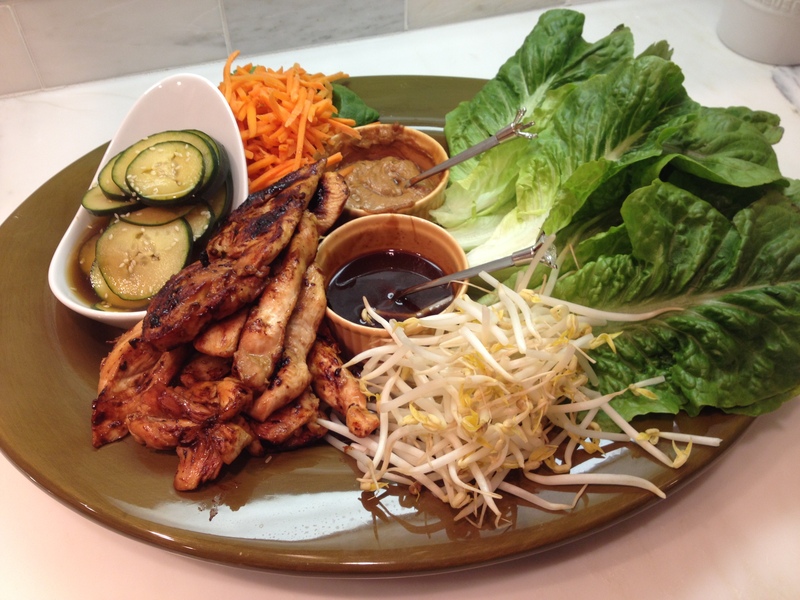 Assemble lettuce leaves, chicken tenders, shaved carrots, bean sprouts, fresh cilantro sprigs and sauces on a large serving platter. Enjoy! Kumquat season is back! This recipe was one I created last year but never had the chance to post. With my entire series on Kumquats (see- Kumquat Tea Cakes, Kumquat Chutney, Kumquat Curry Chicken, Deconstructed Kumquat Salad), I may have burned myself out on those tiny little citrus goodies. So here is my chance at filing this recipe out of my drafts, a spring cleaning of blog posts, if you will. These days Hubs and I are so busy I need to combine multiple things at once, like adding drinks into my sauces. This somehow makes me feel like I’m multi-tasking my way through the kitchen. What could be better and possibly more necessary than combining one’s favorite bloody mary mix into a BBQ sauce fit for spring and summer? The kumquat puree adds a fabulous citrus tang, unlike anything you’ve ever tasted. What’s with the Hoosier Momma? Well, I must confess, this stuff is impossible to get on the West Coast in stores. So unless you have friends in the midwest, I suspect you’ll have to swap out the mix. If you live in SoCal, I love Ballast Point Bloody Mary Mix. Just remember to pick a spicy thick mix, Mr. T’s will likely give you a runny sauce. Add all ingredients to large sauce pan. Bring to boil and simmer uncovered for approximately 20 minutes or until the consistency of ketchup. Sauce will thicken as it cools. 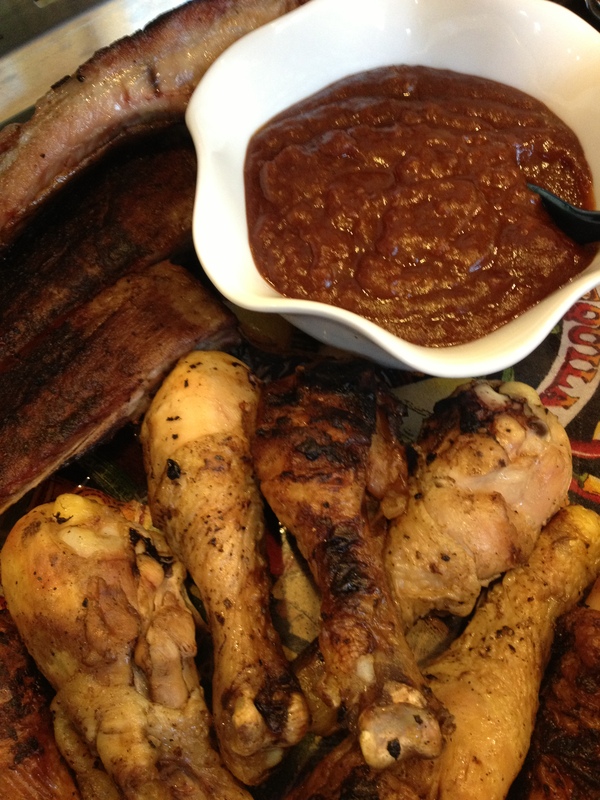 Makes 1 1/2 cups barbecue sauce. With a paring knife cut and separate pulp from rind. Coarsely chop rinds and add to saucepan with 1/2 cup of water, 5 tablespoons of light corn syrup and 1/4 teaspoon ground ginger. Simmer covered for 45 minutes. Cool and place in food processor and pulse for 3 minutes or until pureed. Y ou knew something healthy was coming after my last post. It turns out that four weeks into bootcamp- I’m not starving, I’m losing weight, and I’m still drinking (albeit a lot less) wine. Hubs has been my rock. He’s this uber-happy 5:30am alarm-setting, goal-maintaining, worker-outer. He sets my alarm, wakes me up with the happiest pep-talk, and before I’ve even made it to the closet he’s already downstairs slogging out some sort of “Insanity” video. Since the time change, the bootcamp works out in the dark (headlamps and all) in a local park that doesn’t even open until 6:30- we are a dedicated group. Hubs has also been such a trooper with the food. Less bacon, more tofu and no complaints (at least not within my earshot). And the biggie- NO DRINKING Monday-Thursday. Yikes. That one’s been tough. It’s definitely reunited that TGIF feeling in our house. I’d like to tell you 4 less days of drinking wine has saved us money, but my last trip to Trader Joes proved me wrong. I dropped $200 and had no booze in my cart- those dang protein bars are such a rip off. 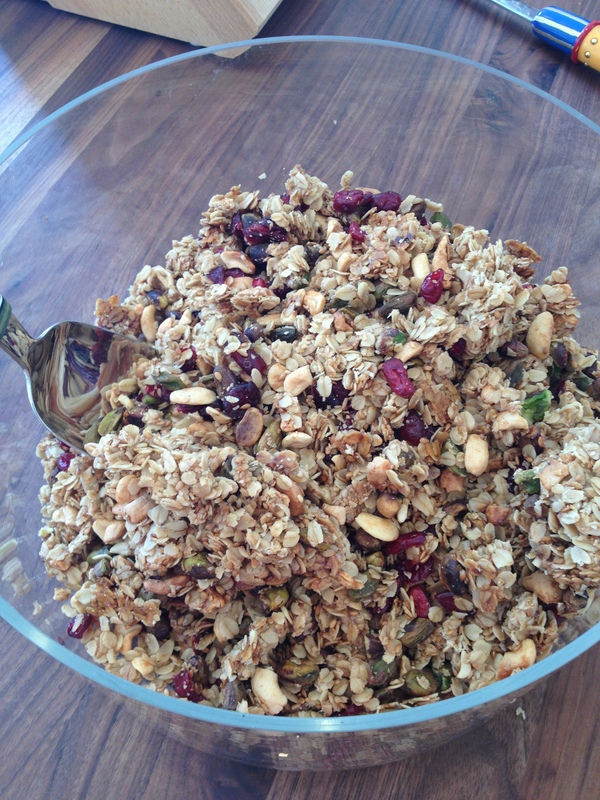 One of mine and Hubs new absolute obsessions is this Granola recipe. I make it at least once a week and have tweaked it 12 ways from Saturday. But the version below is Hubs absolute favorite. Hubs likes his granola clumpy, part cereal, part granola bar. If you prefer your granola less clumpy, cut down on the amount of honey. I even served this Easter morning along with non-fat greek yogurt, Mexican Breakfast Quiche (see previous post) and Blueberry Quinoa Pancakes (recipe to come) and of course… Mimosas. Preheat the oven to 325. Line a baking sheet with nonstick foil. You can used parchment or wax, but it doesn’t get as crunchy. In a large bowl combine all ingredients except cranberries. Combine until well coated. Spread onto a large rimmed baking sheet and bake at 325 for 30-45 minutes, depending on your oven. Granola should be a golden brown. Let cool to room temperature on the sheet over a wire rack. Mix in cranberries and store in containter.